COMBINE butter, brown sugar and walnuts. 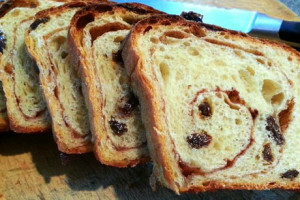 TEAR raisin bread into 1/4 to 1/2-inch pieces. PLACE apples in a 9-inch square or round baking dish. Pat bread mixture firmly over apples. BAKE 40 to 45 minutes or until top is golden brown and apples are soft.